This video explains the call and response technique. It gives a background, how to use it, and different examples. This would be a great video to watch for teachers who want to implement different call and responses in their classroom. The group-response technique is sometimes referred as a call-and-response. It is a catchy short phrase or song that the teacher starts and then the students end. Once the students hear the teacher beginning the call, they know they need to look at the teacher and stop what they are doing while they respond. 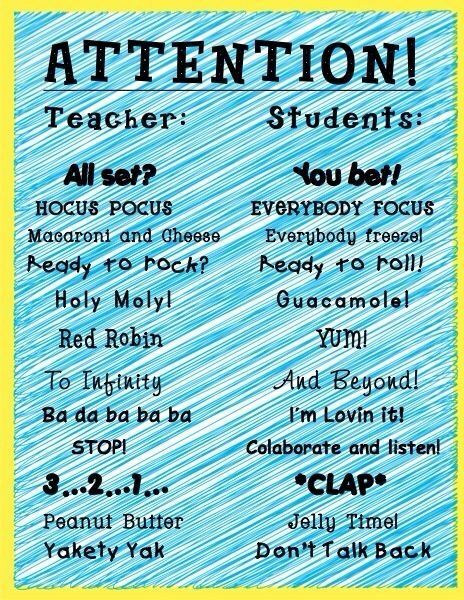 This would be a great intervention for special education students because it is part of a routine and is used multiple times throughout a day. There are no surprises, they know exactly what to do. When choral response is used, some students may offer incorrect answers; the instructor should provide feedback to the group about the 'majority' response (the response called out or signaled by the largest number of students). The teacher can keep students focused on the group activity by occasionally calling on a randomly selected individual child to answer. Choral responding works best when delivered at an appropriately rapid pace." (InterventionCentral, 2015). "Regular instructor feedback is build into both choral responding and use of response cards. In giving feedback, the teacher should give students information about whether the majority class response is correct, and immediately provide the correct response and supporting explanation if a significant number of students had answered incorrectly. Those items missed by many students should be presented again later in the lesson to ensure that students have learned the material after receiving corrective feedback. The instructor should also praise students periodically for for appropriate and prompt use of the group response format. Additionally, the teacher should acknowledge and validate answers that differ from the instructor's but could still be considered correct." (InterventionCentral, 2015). "Students can respond as a group by displaying 'response cards' which display their answers to a teacher question or academic problem. Two response-card formats may be used: (1) cards with pre-printed response choices (e.g., "YES/NO") and (2) cards on which students write their responses. encourage students to try their best in spelling their responses but reassure them that misspellings will not be counted against them." (InterventionCentral, 2015). Teaching, K. (2015, August 10). Teach Like a Champion Technique 23 - Call and Response. Retrieved October 23, 2015.